Burgoyne's surrender at Saratoga spurred King Louis XVI to take France to war against Britain. French intervention forced the British to re-think strategy, and some statesmen even were willing to settle for home rule for the colonies, a proposal that the rebelling colonists rejected as inferior to the total independence that appeared in sight. A powerful French navy now threatened all British overseas holdings, forcing Britain to reinforce important parts of the empire like the sugar islands of the Caribbean - and also making it no longer practical for the British to occupy both New York City and Philadelphia. The main British army in Philadelphia, now under Sir Henry Clinton, was ordered to return to New York. But because of the French naval threat, an evacuation solely by sea would be too risky. Instead, Clinton would march the majority of his army across New Jersey to Sandy Hook for the short crossing into New York harbor. Not averse to battle, Clinton was to take his time marching in the heat of the summer. The main American army under George Washington was at Valley Forge outside of Philadelphia, where it had been drilled and trained by 'Baron von' Steuben into a respectable army. The army was still unproven, however, and many patriots questioned both the wisdom of relying on a professional army and the abilities of its commander in chief. Discovering the British move across the Delaware River and into New Jersey, Washington marched his army east, crossing the Delaware and through New Jersey, pursuing the British army with the hope of attacking it. Attacking the British army would be a bold move - and it proved controversial. Washington gave command of the 5,000 man advance guard to Lafayette, the 20 year old French volunteer, a Major General despite his youth. When Lafayette proved too rash, Charles Lee, the most senior field commander, was given the command instead. Lee had recently returned from British captivity, and he was skeptical of the army's skill in battle and unfamiliar with many of his subordinates. 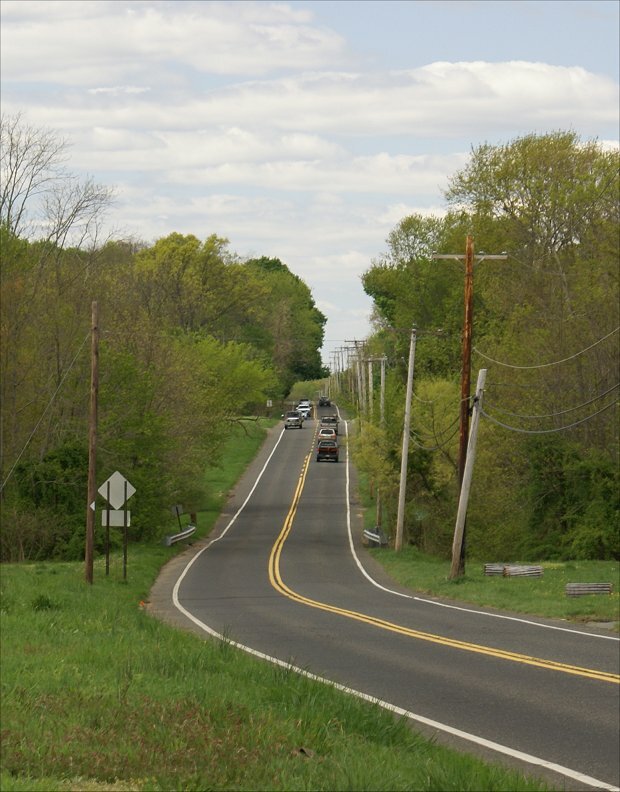 On the morning on June 28th, when an opportunity appeared to strike a smaller British force, Lee's advance guard attacked the British rear guard near Monmouth Courthouse, an area now lost to development. The advance did not go well for the Americans, and when some cannon withdrew a short distance, infantry units began to fall back without orders. Clinton saw the opportunity to smash Lee's force against a ravine, or morass, and he now turned on Lee with a superior force of 10,000 redcoats. With his men withdrawing without orders, Lee saw that he had little choice but to continue the retreat to favorable defensive terrain. With his usual staff officers unavailable, Lee's subordinates were in the dark as to what to do, and they did not understand the reason for the retreat. Lee's orders for some of his units to take a stand and cover the retreat were not followed, and Lee's temper began to get the better of him. Lee's men were falling back along this roadway through the grass from the right side of the over 180 degree panorama. Washington was riding ahead of the main body and encountered men of the retreating advanced guard - men who had no idea exactly why they were retreating. Here, an irked Washington met a frustrated Charles Lee. Exactly what was said is unknown - differing accounts are given - but Lee believed that he was relieved of his command. 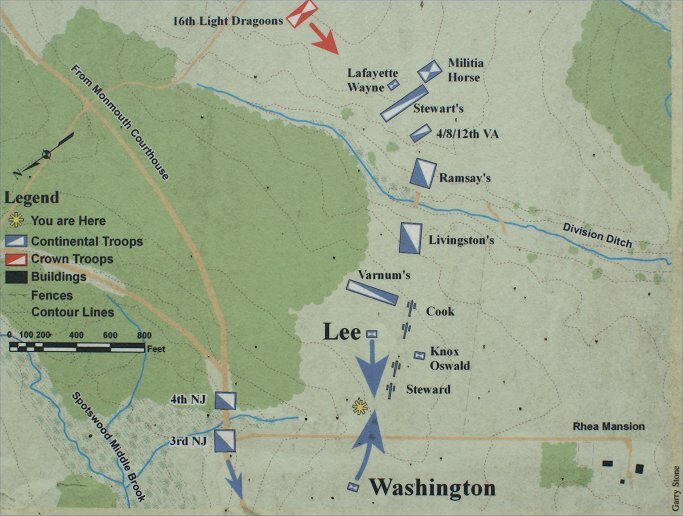 A short time later, Lee believed that Washington sent Lee to the rear to organize his men. Washington ordered Anthony Wayne with a group of picked men ahead and into the woods on the right side of the panorama to delay the British, then he returned to the main body to organize a line of battle. As the British crossed the Middle Morass and proceeded forward, American artillery near where the photo was taken fired solid shot and canister into them. Wayne's men ambushed the Guards and Grenadiers and the 16th Light Dragoons as they passed, and the British responded with an immediate attack. In hand to hand fighting, Wayne's men were forced back, and the artillery was withdrawn in the face of the advancing British. The British had paid dearly for this victory, and the troops were not in good order. After being forced back in hand to hand combat, Gen Wayne's men marched past this hedgerow (left to right in the above panorama) with the British in pursuit. The British pursuit was not in organized ranks, and it became an attack on American troops under Varnum and Livingston, who had just recently arrived to defend this hedgerow. Clinton and Cornwallis were present, urging the men of a portion of the 16th Light Dragoons to closely pursue Wayne's men, in effect using them as human shields against American fire. The Continentals, however, fired through and over the heads of Wayne's men, forcing the British cavalry to fall back onto approaching British troops. The Grenadiers were also attacking. Clinton urged them on without stopping to form, and he was lucky to escape with his life as an American officer fired at him, but missed, at close range. The fighting was intense, with Washington' aides-de-camp Alexander Hamilton and Henry Laurens having their horses shot from under them. Livingston was wounded, and a third of his men were killed or wounded. As many as ten volleys were exchanged in just three to four minutes, but the Americans held firm - until, that is, events transpired elsewhere. The fence on the left side of the panorama is the location of the hedgerow, and it extended along the edge of the modern orchard to Tour stop 5, where Clinton was attacking with the Grenadiers. To the left of the Grenadiers were men of the 16th Light Dragoons. Near here, modern Tour Stop 4, the Light Dragoons passed through the hedgerow, flanking the American line. Lee and Henry Knox were with American artillery and some militia cavalry on slightly higher ground behind the hedgerow. The heavily outnumbered militia cavalry did not stay long. Without support, Lee ordered the artillery back, and seeing the hopelessness of the situation for his infantry, he ordered them back as well. The American line along the hedgerow had extended along the edge of the modern orchard on the right side of the panorama to the Freehold-Englishtown Road. Part of the 16th Light Dragoons had attacked down the road in the center of the panorama led by Sir Henry Clinton himself, but they were repulsed. The Guards attacked here next in an area vacated by the retreating 1st New Jersey under Ogden, the area across the road - wooded at the time of the battle. With the successful British cavalry attack on the American right, the American line along the hedgerow collapsed, with the British pursuing closely. On the left side of the panorama you can faintly see the road descending out of view, where is crosses the Spotswood Middle Brook. The action would shift there - and to the heights that you can see beyond, where Washington was forming his main body for battle. 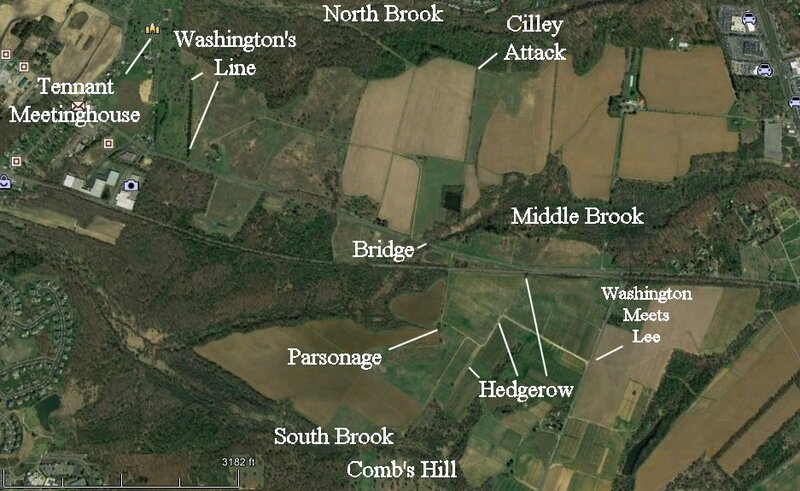 The Americans fell back across Spotswood Middle Brook near the modern road bridge to the safety of a line of artillery positioned by Washington on the hills beyond. Gen. Lee was among the last to cross. The 2nd Bn of Grenadiers tried to storm the bridge, but the artillery fire was too much. 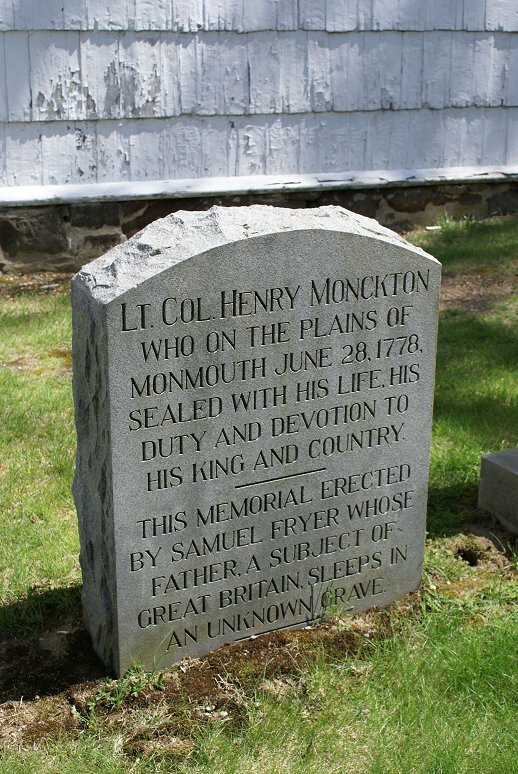 Lt Col Monckton was killed in the attack. 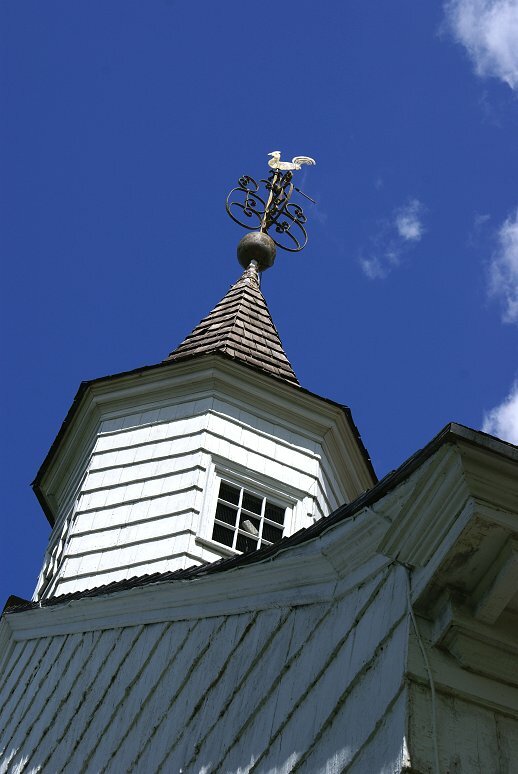 He is now buried at the Tennant Meeting House. His sword and flag are on display in the Monmouth County Historical Association Museum. 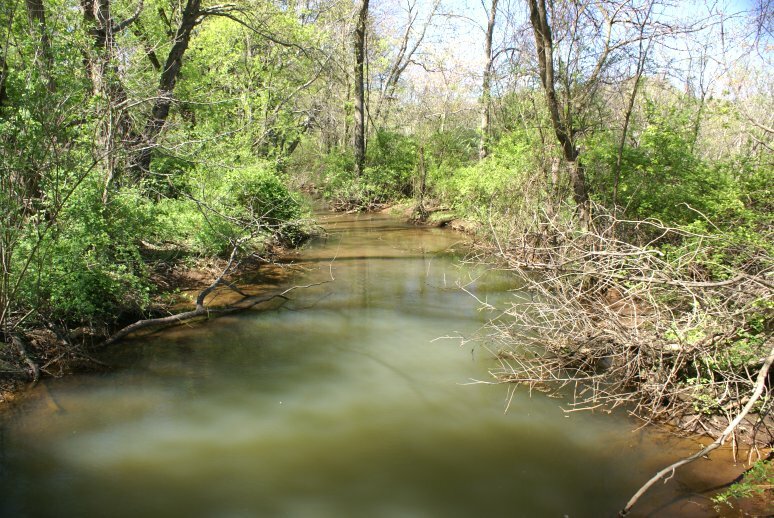 Washington now had most of his army deployed in line of battle on the high ground west of Spotswood Middle Brook with Lee's men going into reserve at Englishtown. 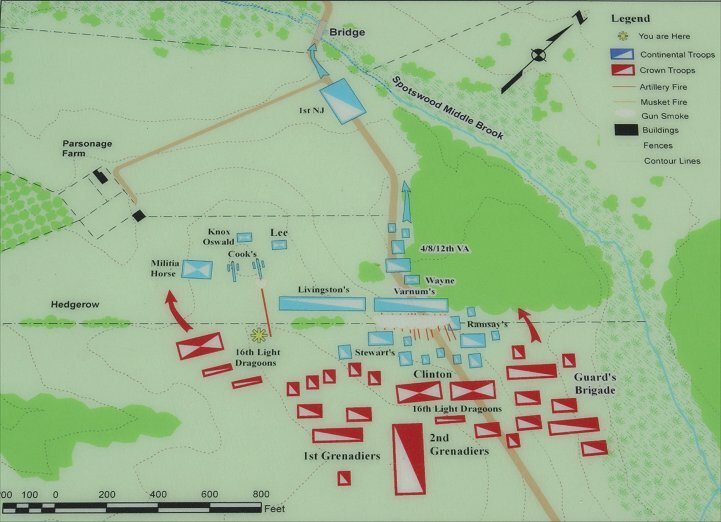 A major British attack on the position would be costly, and a lull set in for about two hours while with both sides fired artillery at the other side. 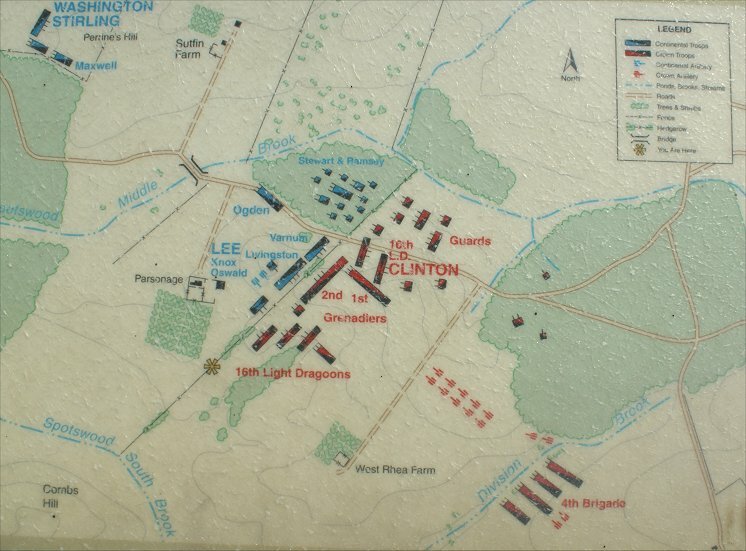 During the artillery duel, Clinton brought up more troops. Washington was alerted by a local resident to the potential of Combs Hill. Nathanael Greene had been sent to protect Washington's right, or southern, flank, and a messenger from Washington diverted him off the main road to Combs Hill. Here, artillery under the Frenchmen du Pleiss fired into the flank of British infantry and artillery along the Hedgerow. This ended the two hour artillery exchange and spurred Clinton to withdraw his infantry and all but one of his guns from the Hedgerow to the protection of the reverse slope. The heat of the day reached 100 degrees, and it killed a number of men on both sides that day. In the American artillery, a wife of an artilleryman, Molly Hays, is thought to have filled canteens at this spring. Some stories even have her serving the guns. In 1822, the Pennsylvania government granted her a pension for wartime service. Clinton had his 3rd Brigade north of Middle Brook separated from the main body near the Hedgerow. In the panorama above, Middle Brook is in the distant tree line. To go along with the withdrawal from the Hedgerow, Clinton ordered the withdrawal of the 3rd Brigade as well. Washington sensed the vulnerability of the British 3rd Brigade, and at around 4:30, he decided to send troops forward to harass them - two battalions, one under Colonel Parker of Virginia, the other picked men under Colonel Cilley. The two battalions advanced in column under cover of the bushy North Brook Valley, hidden from view of the British on the other side. Deploying into line facing south, the Cilley's battalion advanced through an orchard toward the Highlanders of the 42nd Regiment, leaving Parker's battalion behind. The Highlanders withdrew in the face of the determined Americans. Beyond the orchard, the British passed through a gap in the fence then some low ground. About 2/3 of the way up the following slope, the Highlanders formed for a brief a stand out of sight of the American artillery. The approaching Americans took down the fence and received a volley from the British, who then withdrew. The British then stopped to make a stand just north of the Middle Brook supported by a couple of 3 pounders. The Americans traded volleys for a time before the Brits finally fell back behind the brook, having lost three or four men killed or mortally wounded. Cilley didn't pursue, having lost several men, including some to the heat. Clinton now decided that although he had failed to crush a portion of Washington's army, honor was satisfied, and it was now time to continue the withdrawal toward Sandy Hook. Seeing the withdrawal of the 3rd Brigade and the lightly held Hedgerow, Washington ordered Anthony Wayne forward across Middle Brook. Wayne wanted to take three brigades, or around 1,300 men, but Maj. Gen. Arthur St. Clair, serving as an aide, prevented this, probably in accordance with Washington's plan, giving Wayne just a single brigade - or 400 men. Wayne advanced from the bridge to the Hedgerow, attacking the 1st Bn of Grenadiers. Facing around 700 grenadiers, Wayne was outmatched, and the 33rd Regiment entered the fray with over 300 men, overlapping Wayne's flanks. Wayne ordered his men to aim at British officers, but the British attack was too much, and the Americans fell back toward the Parsonage. The Americans took over among the buildings, but they had become disordered while falling back. Nevertheless, they inflicted losses on the pursuing redcoats who also also suffered from American artillery on Comb's Hill. The British fell back. It was now around 7pm. Washington had called forward his reserve and was preparing to attack Clinton's flanks, but darkness halted the efforts. Although Washington hoped to renew the battle the next day, Clinton renewed the retreat toward Sandy Hook at midnight Casualty figures for the Americans were about 70 killed, 160 wounded, and 140 missing - relatively light compared to estimated British casualties of about 250 killed and 1,200 wounded - around 2,000 total for the campaign as a whole. The British took the back roads and reached the safety of Sandy Hook - a French fleet arrived off New York, but nervous about the sandbars, its commander instead headed for Newport, Rhode Island. Washington had headed to White Plains anyway, so coordination would have been difficult. With the success of Gates at Saratoga compared to the relative lack of success of the main army, Washington needed a victory to secure his position as commander in chief. In the public relations realm, Monmouth was that victory. Although Lee's actions had been understandable in light of the circumstances, and the retreat of his troops perhaps unavoidable, his competence was now in question. His personality made him an unpopular figure, and he became the natural scapegoat. He demanded a court martial, but an acquittal would be a humiliation for Washington, and that was not in the cards, so Lee was suspended from the army for a year, effectively ending his career. Washington and the concept of the professional army had weathered the storm. 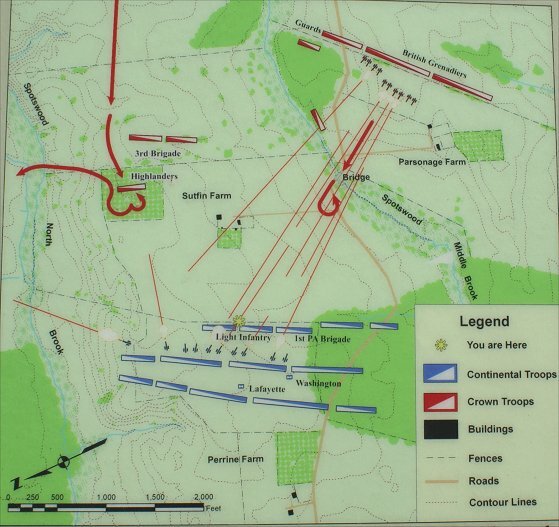 Monmouth was the last major clash of armies in the North. With French intervention, Britain had a worldwide empire to defend, so efforts in North America were significantly scaled back and shifted to the South, where, it was hoped, a substantial Tory population would welcome the British army.